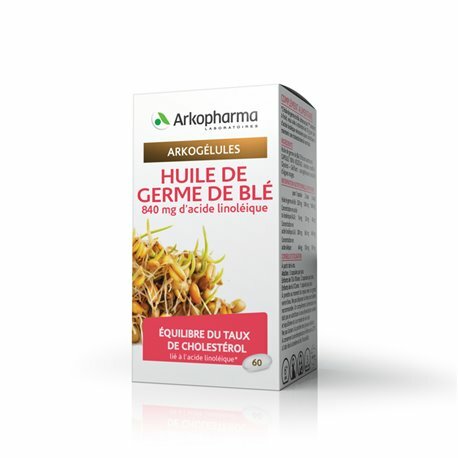 The ARKOCAPS WHEAT GERM OIL, dietary supplement recommended for people with cholesterol imbalance. Wheat is one of the oldest in the world grain and was cultivated there over 8000 years ago in Mesopotamia. Decrease its use in our modern diet has consequences organic disorders more common. In herbal medicine the seeds from which oil is extracted are used. They contribute to the formation of prostaglandins. These prevent the deposition of cholesterol and saturated fats artery walls. It protects the walls of arteries and reduces cholesterol in blood. It also has a protective effect on essential fatty acids and prevents the formation of toxins in the body. The ARKOCAPS Oil Wheat Germ prevent atherosclerosis and cardiovascular disease and help to address the excess cholesterol. Take 1 capsule morning, noon and evening during meals with a large glass of water. to define the most favorable growing conditions, the best region, the best soil, the best exposure and to choose with the greatest precision the part of the most active plant. This selection of medicinal plants is done on a rigorous scientific basis. This is modern herbal medicine. Available for sale in drugstore and pharmacy, these natural extracts Arkocaps plants are among the most used in France. In 1997, ARKOPHARMA created the event by offering the first range of products 100% plant origin, confirming its leading position in herbal medicine: that year, the traditional gelatin used for the capsule shell is replaced by a natural substitute of plant origin: a cellulose derivative. Cellulose surrounds and protects the cells of all plants. The 100% vegetable capsule is totally natural and contains no gluten or preservatives. All Arkocaps are made with cryobrushed plant extracts, a process that guarantees a very high quality, naturally preserving the active principles for optimal assimilation. With 30 years of experience in the field of herbal medicine and dietary supplements, the will and commitment of Arkopharma Laboratories are realized through compliance with standards and certifications.